Barry Alan Crompton Gibb, CBE (born 1 September 1946) is a British singer, songwriter and record producer who rose to worldwide fame as a co-founder of the group Bee Gees, one of the most commercially successful and critically acclaimed groups in the history of popular music. With his brothers, Robin and Maurice Gibb, he formed a songwriting partnership beginning in 1966. Born on the Isle of Man, he was raised in Manchester where he became involved in the skiffle craze, forming his first band, the Rattlesnakes, which evolved into the Bee Gees in 1960 when they moved to Redcliffe, Queensland, Australia. They returned to England where they achieved worldwide fame. He was also known for his high-pitched falsetto singing voice. Gibb shares the record with John Lennon and Paul McCartney for consecutive Billboard Hot 100 number ones as a writer with six. Guinness World Records lists Gibb as the second most successful songwriter in history behind Paul McCartney. Gibb's career has spanned over fifty years. In 1994, he was inducted into the Songwriters Hall of Fame with his brothers. In 1997, as a member of the Bee Gees, he was inducted into the Rock and Roll Hall of Fame and received the Brit Award for Outstanding Contribution to Music. Barry is a fellow of the British Academy of Songwriters, Composers and Authors. For services to music, Gibb (along with his brothers) was appointed Commander in the Order of the British Empire at Buckingham Palace on 27 May 2004. In 2007, Q magazine ranked him number 38 on its list of the "100 Greatest Singers". "Then the gangrene set in. Because in those days, the advancement of medicine simply didn't apply to people with bad scalds, so you didn't have skin grafts, you didn't have things like that. But this was a particularly bad scald, and I think I had 20 minutes to live at some point. The incredible thing for me is that whole two years is wiped from my memory, the whole period of being in hospital. The idea of being burnt is in there somewhere, but I have no knowledge of it. I've got the scars but I have no knowledge". In 1949, the Gibb family relocated to 50 St. Catherine's Drive. Later that year, on 22 December, his two younger brothers Robin and Maurice were born. When the twins were young, they moved to Smedley Cottage, Spring Valley, also in Douglas. Gibb started school on 4 September 1951, three days after his fifth birthday, attending Braddan school. In 1952, the Gibb family relocated to 43 Snaefell Road, Willaston, which became their home for the next two years. The same year, he went to Tynwald Street Infants School. On his seventh birthday in 1953, he went to Desmesne Road Boys School. In 1955, Gibb formed the skiffle group, The Rattlesnakes. Consisted of himself on vocals and guitar, Robin and Maurice on vocals and friends/neighbours Paul Frost and Kenny Horrocks also providing vocals. By 1957, The Rattlesnakes played numbers with songs by Cliff Richard. Paul Anka, Buddy Holly and The Everly Brothers. Gibb himself said that their first song ever played was Paul Anka's "I Love You, Baby", however in 1968, he remembered it as the Everly Brothers' "Wake Up Little Susie". The Rattlesnakes' first professional gig happened on 28 December 1957 in Gaumont Cinema. Around 1958, Gibb's guitar was accidentally broken by Frost, while Frost himself described the incident as "broken in the middle". By May 1958 when the Gibbs moved in Northern Grove it signalled the departure of Frost and Horrocks. The brothers later changed the name of the group to Wee Johnny Hayes and the Blue Cats. Under that name, they performed regularly in Minor 15, a talent contest for under-fifteens held on Thursday nights from 7:00 to 9:00 PM at Princess Club in Chorlton. At the beginning of August 1958, the Gibb family set sail for Australia from Southampton on a ship called Fairsea. Also aboard was Red Symons, future guitarist of Skyhooks, as well as Kylie Minogue's mother. The band later changed its name to Bee Gees. In 1959, the brothers began singing at the Redcliffe Speedway between races to earn money, their vocal talent brought them to the attention of Bill Gates, a radio deejay. Gates was also interested in Gibb's original material including "Let Me Love You" and "(Underneath the) Starlight of Love". After hearing those songs, Gates asked him for more original material for the tape. Gibb quit school in September 1961 and the Gibbs moved to Surfers Paradise. The brothers spent the summer of 1961 and 1962 performing at hotels and clubs in the Gold Coast area. By September 1962, Gibb managed to audition songs to Col Joye. And the Gibb family finally moved in Sydney at the start of 1963. Around the same time, the Bee Gees were signed to Festival but they were assigned to Leedon. Their first single, "The Battle of the Blue and the Grey" was written by Gibb himself. The Bee Gees' original singles from 1963 to 1966 were written by Gibb. Between 1963 and 1966, Gibb's songs were recorded by numerous Australian recording artists including Trevor Gordon, Michelle Rae, Noeleen Batley, Bip Addison, Sandy Summers, Anne Shelton, April Byron, Ronnie Burns, Lori Balmer, Barrington Davis, Jenene and Jon. One of them is his composition "One Road" hit No. 2 in Australia New South Wales Chart and #32 on the Kent Music Report charts for Jimmy Little in 1964. And another of his compositions, "I Just Don't Like to Be Alone" by Bryan Davies, hit No. 25 also in New South Wales Chart in 1964. In 1966, Gibb has won the annual Radio 5KA award for the best composition of the year, "I Was a Lover, A Leader of Men". The Bee Gees returned to England in early 1967. On 24 February, the group passed a live audition with Robert Stigwood and later signed to Robert Stigwood Organization also the same day that "Spicks and Specks" was released by Polydor as a single in England. Stigwood became the manager of the Bee Gees. Colin Petersen and Vince Melouney later joined the band as drummer and lead guitarist. The result was their first international LP Bee Gees' 1st, the second single from the album "To Love Somebody", on which Gibb provided the lead vocal has become a standard song as covered by hundreds of artists consistently throughout the years since. Around the same time, the Gibb brothers contributed backing vocals on the track "Cowman, Milk Your Cow" a song written by Gibb and Robin sung by singer Adam Faith. In 1967, Gibb was in The Speakeasy Club, a nightclub in London where he was introduced by Pete Townshend to John Lennon. Lennon was still wearing his outfit for Sgt. Pepper's Lonely Hearts Club Band photo shoot earlier that day on 30 March 1967; after a couple of scotch and cokes, Townshend said to Gibb, "Do you want to meet John?" and he led Gibb across to a room where Lennon was holding court and Townshend said, "John. This is Barry Gibb, from the group the Bee Gees" to which Lennon replied, "Howyadoin'". "So I met John Lennon's back", Gibb says with a laugh, "I didn't meet his front". Gibb earlier said in 2010 about the meeting, "It was virtually a closed club and you went downstairs and there was a coffin and if you were someone they knew and you were supposed to go in, the wall would turn around... and in you would go. There would be [Rolling] Stones lying around all over the place. It was one of those days when I met John Lennon – from the back. It was Pete Townshend who introduced me... [Lennon said], 'Pleased to meet you', and he carried on talking to his guest." After many stresses on their personal and professional lives, both Barry and Robin collapsed from nervous exhaustion on a flight from Australia to Turkey in 1967. On 23 December 1967, Barry and Robin left England for Australia. As Gibb explained: "But due to time difference we arrived on Christmas Day, we missed Christmas Eve altogether!". The pair celebrated Christmas with their manager Robert Stigwood's family as Gibb said: "We went on to Sydney". Gibb performing with the Bee Gees in 1968. At the end of 1967, fame was taking its toll and the group were at odds with each other. At the start of 1968, the Gibbs were vying for influence in determining the musical direction of the group, creating tension in the studio and on stage. Also in 1968, to promote Horizontal the group made their first appearance on US television on The Smothers Brothers Show as well as The Ed Sullivan Show. The group later filmed a TV special Frankie Howerd Meets the Bee Gees with Frankie Howerd. His 1968 composition "Only One Woman" (UK #5) was the Marbles' most successful single up to date. The Bee Gees were invited by Hollywood manager Lee Hazlewood at his party alongside the members of The Monkees and Honey Ltd.. The photos from that event were leaked, and two of the pictures showing Gibb was talking to actress Angela Cartwright, and the other, is Gibb who was shown playing guitar and the members of Honey Ltd. sing along. In 1969, the Bee Gees released "First of May" as the A-side, with the flip side being "Lamplight" on which Robin sang the lead. Robert Stigwood chose "First of May" to be the A-side. No other songs were released from the album Odessa. Shortly after Robin announced his solo plans, the Bee Gees released their first single without him, "Tomorrow Tomorrow". Barry also worked with Samantha Sang, co-writing and producing two songs "The Love of a Woman" and the B-side "Don't Let It Happen Again" released on Parlophone. He also produced songs for P.P. Arnold including "Bury Me Down By the River" (released as a single) which were originally recorded by the Bee Gees for their 1970 album. In the summer of 1969, Petersen left the group which now only featured Barry and Maurice as the Bee Gees. Pentangle drummer Terry Cox replaced Petersen to complete another 12 songs, but only five songs were released in the album. The film Cucumber Castle, featuring only two Bee Gees, although the film was originally included Petersen. When the group announced that they had split at the start of December 1969, he spent January 1970 writing songs to record the following month. In February 1970, he started to record his first solo album, The Kid's No Good; he released his first solo single, "I'll Kiss Your Memory", but the rest of the songs that were supposed to be on the album were never released and only appeared in bootlegs. "I'll Kiss Your Memory" was not charted in both UK and US but reached #16 in Netherlands in five weeks. Another country ballad "This Time" was chosen as the B-side. Bruce Eder of AllMusic stated that the songs on The Kid's No Good were of country and sentimental numbers. In April 1970 the album Cucumber Castle was released four months after the break-up, featuring only Barry and Maurice, as Robin was working on his solo career. For the first time as a solo artist, he appeared on the panel of judges and performed "One Bad Thing" and "The Day Your Eyes Meet Mine" on Miss Teen Princess of the World pageant in Germany in June, his reaction was "I've not appeared on stage for at least a year and three months, and I really miss people". In July 1970, Gibb travelled to Australia to act as compere for Go-Set, and on that occasion, he gave an interview on the magazine which revealed that sixteen months after the Bee Gees' break-up, but he was still not ready to argue with his brothers, "Obviously, we're still brothers, but we are no longer as a group". "The Day Your Eyes Meet Mine", which he considered as the second single from his debut album and Atco pressed some copies of it in August 1970 with "One Bad Thing" as the B-side. and was distributed to the radio stations in Canada and elsewhere but was not continued and it was decided to focus on a new Bee Gees release (in favour of the Bee Gees' reunion single "Lonely Days") and was released around August. While Polydor planned to release "One Bad Thing" by 2 October. (elsewhere except North America and Canada) Gibb claimed that not only had he been focusing on writing and recording songs, but he had still hoped to be an actor, "I have already had offers to play different parts but, without appearing swell headed, I haven't found the right part yet". "One Bad Thing" was later given by Gibb to his friend Ronnie Burns, a singer from Australia, and later released it as a single on Festival Records. In August, the Bee Gees reunited and recorded together again, writing "Lonely Days" and "How Can You Mend a Broken Heart" at their first reunion session. Two of Gibb's singles were omitted after the group had reunited, "The Day Your Eyes Meet Mine" was withdrawn at the last minute in the US while Polydor planned to release "One Bad Thing" (2 October 1970). In 1971, the group released "How Can You Mend a Broken Heart" which was their first American #1 hit. In October 1971, Gibb recorded three songs for his fan club called Barry Gibb Fan Club; one of the songs, "King Kathy" was released as a single on Lyntone Records. Gibb had remained a constant creative force for the group and, by 1972, had set aside the idea of a parallel solo career and was ready to devote full attention to the band. To Whom It May Concern was the last album recorded fully at IBC Studios and their last album arranged by Bill Shepherd who had worked with the group since 1964. Also in 1972, Gibb moved to Los Angeles to record in The Record Plant studio. In 1973, the Bee Gees moved to Robert Stigwood's RSO Records and released their first singles for Stigwood, "Saw a New Morning" and "Life in a Tin Can". Stigwood was not ready to give up on the group, but he did not believe in the musical direction they were taking. At the suggestion of Jerry Wexler and Ahmet Ertegun of Atlantic Records, Stigwood sent them to work with Atlantic producer and arranger Arif Mardin who produced the next Bee Gees album in 1974. After a United States tour early in 1974, the band started to perform at small clubs in England. "It came to me in a dream, there was a request by Arif Mardin, who was like an uncle to us, he was a great record producer during the song 'Nights On Broadway,' for the Main Course album, which is previous to the 'Fever' syndrome. And he said, 'Can any of you scream, scream in falsetto.' So, you know, give us an ad lib or a scream at the end. So from screaming, it turned into things like 'blaming it all'." At the start of 1975, the band moved to Miami at the suggestion of Eric Clapton to work on their new album with R&B producer Arif Mardin in Criteria Studios. The first song featuring Gibb's falsetto was 1975's "Nights on Broadway". In 1976, Gibb wrote "I Just Want to Be Your Everything", Andy Gibb's first US No. 1, and provided backup vocals. During the year 1976, Gibb met up with Vince Melouney and wrote two songs, "Let It Ride" and "Morning Rain", that were never recorded. In November 1977, the film Saturday Night Fever was released, and its soundtrack became the best-selling soundtrack of all time. During 1977, Gibb co-wrote "Emotion", the song remains Samantha Sang's best-known hit. Gibb and Galuten wrote "Save Me, Save Me" originally recorded by the group Network and later covered by Frankie Valli, Dusty Springfield, Rare Earth, and Teri DeSario. The film Sgt. Pepper's Lonely Hearts Club Band, featuring Gibb as Mark Henderson was shown in July 1978. Andy's third single, "Shadow Dancing", which was credited to all four Gibb brothers, was also a US No. 1 single. 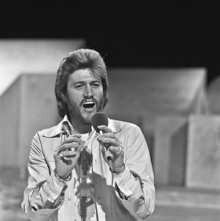 In 1978, Gibb wrote a title song to order for their manager Robert Stigwood's film and stage musical Grease and was later recorded by singer Frankie Valli and reached #1 in the US. The song contains guitar work by Peter Frampton. In February 1978, he provided background vocals for his composition, "Ain't Nothing Gonna Keep Me From You" which Teri DeSario on vocals. After the Bee Gees' successful 1979 Spirits Having Flown Tour to promote the album of the same name, he produced and almost wrote all of the songs on Andy Gibb's final LP, After Dark released at the start of 1980. In September 1980, Gibb produced the three new songs on Andy Gibb's first compilation album, Andy Gibb's Greatest Hits. In October 1980, Barbra Streisand's Guilty was released, produced by the Gibb-Galuten-Richardson team. The two songs of which were vocal duets between Streisand and Gibb are "Guilty" a US Top 10, and "What Kind of Fool" also reached the Top 10 in the US and reached #1 on the US Adult contemporary chart. In 1981, the Bee Gees released Living Eyes. Songs from the album were not disco and the album was not a commercial success. In 1982, Clive Davis asked Gibb to write for Dionne Warwick, who was on his Arista label. Barry produced Warwick's Heartbreaker. The songs were all written by Gibb except "Our Day Will Come". In August 1983, after Gibb met Kenny Rogers who asked for some songs, Gibb recorded his first demo for Rogers entitled "Eyes That See in the Dark". At that time, Robin was working on his How Old Are You? album with Maurice playing instruments. The other songs intended for Kenny Rogers were written in late 1982, then at the start of 1983, Barry continued to record the demos until April 1983, while also recording songs with the Bee Gees for the film Staying Alive. In August 1983, he produced Rogers' new album Eyes That See in the Dark, which includes the song "Islands in the Stream" by Rogers and Dolly Parton which became one of the best-selling singles in country music. In August 1983, Irving Azoff signed Gibb to the MCA Records for North America. Gibb was signed for a few million dollars to a multi-album deal. Polydor still had rights to Gibb's songs outside North America. In September 1984, his album Now Voyager was released. Two singles from the album included "Shine, Shine", a US Top 40 single that reached the Top 10 in their Adult contemporary charts, and "Fine Line" which was less successful only reaching #50 on the dance charts. The film Now Voyager starring Gibb was directed by Storm Thorgerson, in which Gibb is the protagonist, with actor Michael Hordern as his guide through a confusing world between life and death. The film includes a music video on most of the songs on Now Voyager. A video for "Fine Line" featuring Gibb without his trademark beard and was filmed in black and white. In 1985, Gibb started to record demos for Diana Ross, for her album Eaten Alive. Also in 1985, Gibb co-wrote most of the songs on Robin Gibb's album Walls Have Eyes. In late 1985 and early 1986, Gibb wrote new songs for his next album, though his third album Moonlight Madness was not released and most of the songs on that album was later released in 1988. Producer Randy Jackson plays bass on all of the tracks. Gibb co-wrote three songs for Swedish singer Carola on her album Runaway. Also in 1985, Gibb joined the short-lived supergroup the Bunburys with David English. In early 1987, the Bee Gees started to record their first album in six years. In June and July 1987, Gibb and Maurice produced Andy Gibb's four new songs; one of them is "Arrow Through the Heart" which was later released in 2010. In 1987, Gibb co-wrote "Up the Revolution" by Elton John. And in 1988, Gibb recorded two new songs for the Hawks film. In September 1988, the film soundtrack of the film was released by Polydor only in the UK. The songs were all performed by Gibb except "Chain Reaction" (Diana Ross). The single from the soundtrack, "Childhood Days", reached only No. 60 in Germany. Around 1990, the Bee Gees recorded High Civilization. In September 1990, Gibb played guitar and produced "Born to Be Loved by You" by Kelli Wolfe, which was released as an unreleased B-side in August 1993. Around 1992, Gibb played guitar on Lulu's "Let Me Wake Up in Your Arms", released in 1993. In 1993, the Bee Gees recorded and released Size Isn't Everything. In 1994, the Bee Gees and Polydor planned a tour to promote Size Isn't Everything, but it was off in February, due to Gibb's trouble with arthritis in the back, right hand and right knee. Gibb co-wrote "I Will Be There", which was recorded as a demo for Tina Turner and released on Turner's album Twenty Four Seven. In 2001, Gibb co-wrote "I Cannot Give You My Love" with Ashley Gibb, which was intended for Cliff Richard. In September 2001, the Bee Gees re-recorded "Islands in the Stream", which became their last session as a group, as Gibb did not seem to be present on the session in Middle Ear Studios, Miami Beach, Florida. In 2002, Gibb and Michael Jackson recorded "All In Your Name". Also in 2002, Gibb sings background vocals on Michael Bublé's version of the 1971 song "How Can You Mend a Broken Heart". In November 2003, ten months after Maurice's death, Gibb produced and contributed background vocals and guitar to two songs performed by Cliff Richard, "I Cannot Give You My Love" and "How Many Sleeps? "; Maurice's keyboard work from a 2001 demo version was included in this 2003 version. On 2 May 2004, Barry and Robin Gibb received the CBE award at Buckingham Palace; their nephew Adam accepted his father Maurice's posthumous award. Also in 2004, Gibb co-wrote and sang background vocals on his son Steve Gibb's solo single "Living in the Rain". In January 2005, along with many artists, Gibb and his brother Robin recorded vocal parts for the charity single "Grief Never Grows Old" on behalf of victims of the tsunami in the Indian Ocean on 26 December 2004. In April and May 2005, Barbra Streisand recorded songs for her new album produced by Gibb. In August 2006, two Gibb singles, "Doctor Mann" and "Underworld", were released on iTunes. "Underworld" was featured on the film soundtrack of Arctic Tale but not in the film. On 7 December 2006, Gibb joined 4,500 other musicians in a full-page advertisement in the Financial Times newspaper, calling for the British Government to extend the existing 50-year copyright protection of sound recordings in the United Kingdom. The fair play for musicians advertisement proposed that the copyright be extended to the American standard of 95 years and was a direct response to the Gowers Review (published by the British Government on 6 December 2006), which recommended the retention of the 50-year protection for sound recordings. In 2007, "Drown On the River" was released as a single on iTunes. The song later appeared on the soundtrack of Deal. Also in the same year, Gibb sang background vocals on Jamie Jo's song "U Turn Me On" and wrote the theme music for ITV's Grease Is the Word. Also in 2007 Gibb appeared as a mentor in season six of American Idol. On 14 March 2009, Gibb teamed with Olivia Newton-John to present the one-hour finale performance at a star-studded 12-hour live concert at Sydney's Sydney Cricket Ground, part of Sound Relief, a fundraiser to aid victims of the February 2009 Victorian Bushfires that devastated large tracts of heavily wooded and populated south-eastern Australia, where the Gibb family once lived. The concert was televised live nationally across Australia on the Max TV cable network. On 10 July 2009, Gibb was made a Freeman of the Borough of Douglas (Isle of Man). The award was also bestowed upon his brother Robin and posthumously upon his brother Maurice. Also in 2009, Barry and Linda Gibb became US citizens; they retain their British citizenship. In late 2009, Barry and Robin announced plans to record and perform together once again as the Bee Gees. In 2010, Gibb withdrew from a planned appearance on the Gorillaz album Plastic Beach which was released in March. In December 2011, his two songs, "Grey Ghost" and "Daddy's Little Girl" were released. On 21 February 2012, Gibb performed his first solo concert in the US at the Seminole Hard Rock Cafe in Florida. He sang "How Can You Mend a Broken Heart" with Maurice's daughter, Samantha Gibb, who is a singer in her own band. Barry's son Steve was also on stage as lead guitarist and sang a Maurice composition, "On Time". On 20 May 2012, Robin Gibb died, making Barry the sole surviving Gibb brother. Gibb made his debut performance at the Grand Ole Opry on 27 July 2012, performing three songs with Ricky Skaggs Skaggs later recorded "Soldier's Son" on which Gibb added vocals for Skaggs' album Music to My Ears released in 2012. He commenced a world tour in 2013 in Australia called Mythology Tour, featuring the Bee Gees anthology set album of the same name. He was joined on stage by his son Steve and Maurice's daughter Samantha. On that tour, for the first time on stage, Gibb performed "Playdown" (1966), "Every Christian Lion Hearted Man Will Show You" (1967), "I Started a Joke" (1969) and "With the Sun in My Eyes" (1968). Also, for the first time, the music video of the Bee Gees' 2001 song "Technicolor Dreams", written by Gibb, was shown before the show began. This short tour inspired Festival Records to release a box set of the Bee Gees' three Australian albums, The Festival Albums Collection, 1965–1967, and a 'best of' compilation of the group's Australian era songs titled Morning of My Life. On 27 October 2013, Gibb appeared at the Country Music Hall of Fame with Kenny Rogers and Bobby Bare; Gibb performed "Islands in the Stream" with Kelly Lang. In October, Gibb performed at the Grand Ole Opry for the second time with Ricky Skaggs. On 21 December 2013, Barry Gibb made a surprise appearance on the US television show Saturday Night Live at the end of the "Barry Gibb Talk Show" skit with Jimmy Fallon, Justin Timberlake and Madonna. Also appearing that night was Sir Paul McCartney who shared the stage with Gibb during the closing credits where they embraced each other. On 27 January 2014, Gibb appeared on the American television show Late Night with Jimmy Fallon to announce the start of his first solo tour of the US. He performed "You Should Be Dancing" with help from Fallon's backing band, The Roots. Gibb and Fallon sang some Everly Brothers songs, including "Bye Bye Love" and "Wake Up Little Susie". Gibb also sang "To Love Somebody" as a bonus online performance. On 28 January, Gibb was interviewed by the CNN about his brothers and, in that same interview, Gibb talks about Justin Bieber, saying he is "heading for a brick wall". In a Mirror interview with Gibb on 11 July 2014 that he was still mourning following the death of Robin and credits his wife Linda and Paul McCartney for helping him to recover. Gibb appeared on a Paul McCartney tribute album The Art of McCartney released on 18 November 2014 performing "When I'm Sixty-Four". Gibb's friend, country singer TG Sheppard said in an interview with Gary James that Gibb was just moved to Nashville and was going to adopt country music to his genre. On 8 February 2015 at the 57th Annual Grammy Awards, Gibb, along with the group Pentatonix presented the category of Best Pop Vocal Album. On March 26, 2015, Gibb was one of the headlining acts on a music festival called the Hard Rock Rising Miami Beach Global Music Festival alongside Andrea Bocelli, Gloria Estefan, Flo Rida, Jon Secada and Wyclef Jean. For the first time in public, he performed his new song "The Home Truth Song". On 26 June 2016, Gibb was scheduled to perform the "legend" spot at the Glastonbury Festival in England, but pulled out due to a family illness. He did, however, appear with Coldplay as a guest performer singing "To Love Somebody" and "Stayin' Alive". On 28 June 2016, it was announced that Gibb had signed to Columbia Records and will release his second solo album, In the Now on 7 October 2016. The album is Gibb's first album with all new material since Bee Gees' final studio album This Is Where I Came In (2001). In the Now was co-written by his sons Stephen and Ashley, and it was produced with John Merchant. Gibb's first marriage was to Maureen Bates, whom he married on 22 August 1966, when he was 19 years old. The couple lived together for only a short time and were divorced in July 1970. During the taping of the BBC's Top of the Pops in London, Gibb met the former Miss Edinburgh, Linda Gray. On 1 September 1970 (his 24th birthday), Gibb married Gray. Together, they have five children – Stephen (born 1973), Ashley (born 1977), Travis (born 1981), Michael (born 1984) and Alexandra (born 1991). – and seven grandchildren. Barry also became friends with Michael Jackson, as he mentions him in his 11 July 2014 interview with the Mirror: "He would come to Miami and stay in our house. He’d sit in the kitchen and watch the fans outside his hotel on TV, just giggling – 'Hee hee!' He lived upstairs for a while, right before his child-molestation trial. We never discussed the case. We would just sit around and write and get drunk. Michael liked wine – there were a few nights when he just went to sleep on the floor". Gibb also revealed on that interview that he misses Jackson. In January 2006, Gibb purchased the former home of country singers Johnny Cash and June Carter Cash in Hendersonville, Tennessee, intending to restore it and turn it into a songwriting retreat. The house was destroyed by fire on 10 April 2007 while under renovation. On 10 July 2009, Gibb was made a Freeman of the Borough of Douglas (Isle of Man). The award was also bestowed upon his brother Robin and posthumously upon his brother Maurice. Also in 2009, Barry and Linda Gibb became US citizens. They have dual citizenship. Barry has homes in Miami, Florida and in Beaconsfield, Buckinghamshire, set in 90 acres of English countryside. Gibb's influences when he was in the Rattlesnakes were Tommy Steele, The Mills Brothers, The Everly Brothers, Paul Anka and Cliff Richard. The Bee Gees acknowledged that they would sing in the style of the Everlys and then add a third harmony; the result was "New York Mining Disaster 1941" (1967). When Gibb heard Roy Orbison's song "Crying", he said: "That was it. To me that was the voice of God." Gibb on praising the vocal skills of Frankie Valli as well as one of his influences, ""Frankie Valli has become one of the hallmark voices of our generation. He created a style that we all still strive to emulate." Gibb was also influenced by country music as his songs on the 1970 unreleased The Kid's No Good were the evidence: "Country music always inspired us. I love Nashville and I love this music. Since my brothers passed, I’ve been able to be self-indulgent. I’ve been able to go where I love the music". Gibb was ranked by Q magazine at number 38 on their list of "100 Greatest Singers" in 2007. Gibb had a highly successful career as a member of the Bee Gees, a group near the top of the all-time top-sellers list. When the group was inducted into the Rock and Roll Hall of Fame in 1997, their citation read "Only Elvis Presley, The Beatles, Michael Jackson, Garth Brooks and Paul McCartney have outsold the Bee Gees". The trio's contribution to Saturday Night Fever pushed the film's soundtrack past the 40 million mark in sales. It reigned as the top-selling album until Michael Jackson's Thriller. They are the only group in pop history to write, produce and record six straight No.1 hits. They have 16 Grammy nominations and nine Grammy wins. The three Gibb brothers were appointed Commanders of the Order of the British Empire (CBE) in 2002. On 2 May 2004, Barry and Robin received their awards at Buckingham Palace, along with their nephew Adam, who collected the award on behalf of his father Maurice, who had died in January 2003. Gibb is also a prolific and successful songwriter and a fellow of the British Academy of Songwriters, Composers and Authors. In 1977, Gibb saw five of his songs simultaneously enter the Top Ten of the Billboard Hot 100 and, for one week in March, four of the top five songs were written by him. His songs were No. 1 for 27 out of 37 weeks from 24 December 1977 to 2 September 1978. Gibb also holds a very unusual record, in that he is the only songwriter in history to write four successive US number one hits: in 1978, the Bee Gees' "Stayin' Alive" was replaced at number one by Andy Gibb's single, "Love Is Thicker Than Water", followed by the Bee Gees' "Night Fever" for their longest run, seven weeks. This was then replaced by Yvonne Elliman's "If I Can't Have You". As a songwriter Gibb has had No. 1 songs in the 1960s, 1970s, 1980s 1990s and 2000s, when "Islands in the Stream" became No. 1 in the UK as the comic relief single for 2009. His compositions for the Bee Gees have been recorded by numerous artists, including José Feliciano, Celine Dion, Al Green, Wyclef Jean, Janis Joplin, Jimmy Little, Barry Manilow, Olivia Newton-John, Roy Orbison, Elvis Presley, Kenny Rogers, Diana Ross, Nina Simone, Barbra Streisand, Samantha Sang, Tina Turner, Conway Twitty, Frankie Valli, Luther Vandross, Sarah Vaughan, Jennifer Warnes, Dionne Warwick and Andy Williams. Australian musician David Campbell, on praising Gibb on comparing The Beach Boys and the Bee Gees: ""And like Brian Wilson, Barry Gibb’s melodies made the songs timeless". While his solo songs have also been recorded by number of artists, including Lou Reizner, Samantha Sang, P. P. Arnold, Ronnie Burns, Jerry Vale and many others. As a record producer, Gibb produced albums for Andy Gibb, Barbra Streisand, Dionne Warwick, Kenny Rogers and Diana Ross. For his discography with the Bee Gees, see Bee Gees discography. ↑ V. Bogdanov, C. Woodstra and S. T. Erlewine, All Music Guide to Rock: the Definitive Guide to Rock, Pop, and Soul (Milwaukee, WI: Backbeat Books, 3rd edn., 2002), ISBN 0-87930-653-X, pp. 85–6. ↑ Summers, Kim. "Robin Gibb". Allrovi. Archived from the original on 19 May 2012. Retrieved 20 May 2012. ↑ "The Story About the Bee Gees / Part 1: 1940–1950". BrothersGibb.org. Retrieved 17 June 2013. ↑ OMalley, Brendon (11 January 2009). "Bee Gees real Brisbane music pioneers". Courier Mail. Retrieved 16 February 2011. ↑ Smith, Steve. "First Abba song in 18 years and Hollywood honors McCartney". SGVTribune.com. Archived from the original on 25 May 2012. Retrieved 16 April 2012. 1 2 "Fellows – The British Academy of Songwriters, Composers and Authors". Basca.org.uk. Retrieved 27 September 2014. ↑ "Q Lists". Rocklist.net. Retrieved 20 February 2015. 1 2 3 Melinda Bilyeu; Hector Cook; Andrew Môn Hughes. The Bee Gees. Retrieved 10 March 2015. ↑ "Featured Articles – Robin Gibb". TheGenealogist.co.uk. 22 December 1949. Retrieved 23 September 2012. ↑ "Hippy days of Bee Gee Robin and his bride: First anniversary picture released by Dwina ahead of posthumous album launch". Dailymail.co.uk. July 30, 2014. Retrieved 10 March 2015. 1 2 3 4 5 6 7 8 9 10 11 Hughes, Andrew. The Bee Gees – Tales of the Brothers Gibb. Retrieved 29 January 2013. ↑ "10 pound Pom arrival lists go online". Perth Now. Retrieved 1 December 2014. ↑ Brennan, Joseph. "Gibb Songs: 1946–1962". Retrieved 1 December 2014. ↑ Brennan, Joseph. "Gibb Songs: 1966". Retrieved 1 December 2014. ↑ Nimmervoll, Ed. "Jimmy Little". Howlspace – The Living History of Our Music. White Room Electronic Publishing Pty Ltd. Archived from the original on 27 July 2012. Retrieved 10 March 2015. ↑ McFarlane, Ian (1999). Encyclopedia of Australian Rock and Pop. Archived from the original on 30 September 2004. Retrieved 10 March 2015. ↑ Brennan, Joseph. "Gibb Songs: 1964". Retrieved 1 December 2014. ↑ "Billboard: Thorpe Gets Aussie Award". Billboard: 66. August 13, 1966. Retrieved 13 March 2015. ↑ "From the Music Capitals of the World". August 27, 1966: 50. Retrieved 13 March 2015. ↑ "Bryan Davies – Love and Money". 45cat. Retrieved 31 March 2015. ↑ Brennan, Joseph. "Gibb Songs: 1967". Retrieved 30 December 2013. ↑ Eells, Josh (July 4, 2014). "Barry Gibb: The Last Brother". Rolling Stone. Retrieved 10 March 2015. ↑ WENN (December 6, 2010). "Bee Gees – Gibb Still Cherishes First Lennon Meeting In Exclusive Club". contactmusic.com. Retrieved 10 March 2015. ↑ Bianculli, David. Dangerously Funny: The Uncensored Story of "The Smothers Brothers Comedy Hour". Retrieved 13 March 2015. ↑ "Monkee Parties". psycho-jello.com. Retrieved 10 March 2015. ↑ "Samantha Sang – The Love of a Woman / Don't Let It Happen Again". 45cat. Retrieved 11 March 2015. ↑ "P.P. Arnold – Bury Me Down By The River / Give A Hand, Take A Hand". 45cat. Retrieved 11 March 2015. ↑ Brennan, Joseph. "Gibb Songs: 1969". Retrieved 2 December 2014. ↑ Sandoval, Andrew (2012). The Day-By-Day Story, 1945–1972 (Paperback) (1st ed.). Retrofuture Day-By-Day. pp. 102–115. ISBN 978-0-943249-08-7. ↑ "Barry Gibb – The Kid's No Good (Isle of Man release)". Discogs. Retrieved 22 February 2015. ↑ "Barry Gibb – The Kid's No Good (Hong Kong release)". Discogs. Retrieved 22 February 2015. ↑ "Barry Gibb – I'll Kiss Your Memory". dutchcharts.com. Retrieved 22 February 2015. ↑ Eder, Bruce. "The Kid's No Good – Barry Gibb". AllMusic. Rovi Corporation. Retrieved 11 March 2015. 1 2 3 Brennan, Joseph. "Gibb Songs: 1970". Retrieved 30 December 2013. ↑ "45 discography for ATCO Records". Globaldogproductions. Retrieved 1 January 2014. ↑ "ONE BAD THING RONNIE BURNS BARRY GIBB/BEE GEES. B CADD". popsike.com. Retrieved 11 March 2015. ↑ "Barry Gibb – King Kathy". Discogs. Retrieved 30 December 2013. ↑ Brennan, Joseph. "Gibb Songs: 1972". Retrieved 31 December 2013. ↑ Brennan, Joseph. "Gibb Songs: 1973". Retrieved 31 December 2013. ↑ Brennan, Joseph. "Gibb Songs: 1974". Retrieved 31 December 2013. ↑ "Bee Gees – Nights on Broadway Songfacts". Songfacts. Retrieved 30 December 2013. 1 2 Brennan, Joseph. "Gibb Songs: 1976". Retrieved 23 April 2013. ↑ "Songwriters Hall of Fame – Barry Gibb". songwritershalloffame.org. Retrieved 31 March 2015. ↑ "Network – Save Me, Save Me". Discogs. Retrieved 13 March 2015. ↑ "Frankie Valli – Save Me, Save Me". 45cat. Retrieved 31 March 2015. ↑ "Dusty Springfield – Living Without Your Love". Discogs. Retrieved 31 March 2015. ↑ "Rare Earth – The Best of Rare Earth". Discogs. Retrieved 31 March 2015. ↑ "Teri De Sario – Pleasure Train". Discogs. Retrieved 31 March 2015. ↑ Brennan, Joseph. "Gibb Songs: 1977". Retrieved 23 April 2013. ↑ Brennan, Joseph. "Gibb Songs: 1980". Retrieved 31 December 2013. ↑ Brennan, Joseph. "Gibb Songs: 1982". Retrieved 31 December 2013. ↑ Cardwell, Nancy. The Words and Music of Dolly Parton. Retrieved 13 March 2015. ↑ Brennan, Joseph. "Gibb Songs: 1983". Retrieved 31 December 2013. ↑ Brennan, Joseph. "Gibb Songs: 1984". Retrieved 31 December 2013. ↑ Brennan, Joseph. "Gibb Songs: 1985". Retrieved 31 December 2013. ↑ Brennan, Joseph. "Gibb Songs: 1986". Retrieved 31 December 2013. ↑ Brennan, Joseph. "Gibb Songs: 1987". Retrieved 31 December 2013. ↑ Brennan, Joseph. "Gibb Songs: 1988". Retrieved 31 December 2013. ↑ Brennan, Joseph. "Gibb Songs: 1990". Retrieved 17 April 2013. ↑ Brennan, Joseph. "Gibb Songs: 1992". Retrieved 17 April 2013. ↑ Brennan, Joseph. "Gibb Songs: 1993". Retrieved 17 April 2013. ↑ Brennan, Joseph. "Gibb Songs: 1994". Retrieved 17 April 2013. ↑ "Joseph Brennan – Gibb Songs: 2001". Columbia.edu. Retrieved 27 September 2014. ↑ "Joseph Brennan – Gibb Songs: 2002". Columbia.edu. Retrieved 27 September 2014. ↑ "Joseph Brennan – Gibb Songs: 2003". Columbia.edu. Retrieved 27 September 2014. 1 2 "Barry, Robin and Maurice's son Adam received the CBE award". Brothersgibb.org. 27 May 2004. Retrieved 2 June 2011. ↑ "Joseph Brennan – Gibb Songs: 2005". Columbia.edu. Retrieved 27 September 2014. ↑ "Joseph Brennan – Gibb Songs: 2006". Columbia.edu. Retrieved 27 September 2014. ↑ "Being For The Benefit Of British Musicians". Stereogum.com. Retrieved 2 June 2011. ↑ "Joseph Brennan – Gibb Songs: 2007". Columbia.edu. Retrieved 27 September 2014. 1 2 Rachael Bruce (10 July 2009). "Bee Gees named Freemen of the Borough". Isle of Man Today. Retrieved 11 July 2009. ↑ BBC News (15 October 2009). "Bee Gees to perform on Strictly". Archived from the original on 18 October 2009. Retrieved 16 October 2009. ↑ Brennan, Joseph. "Gibb Songs: 2010". Retrieved 17 April 2013. ↑ Brennan, Joseph. "Gibb Songs: 2011". Retrieved 17 April 2013. ↑ "Barry Gibb Performs his First U.S. Solo Concert at Hard Rock Live on 21 February". Hardrocklivehollywoodfl.com. 26 January 2012. Retrieved 16 April 2012. ↑ "Gibb died from kidney, liver failure". Toronto Sun. Retrieved 10 March 2015. ↑ "Barry Gibb to make debut at Grand Ole Opry – Celebrity Circuit". CBS News. Retrieved 23 September 2012. ↑ Joseph Brennan. "Gibb Songs: 2012". ↑ "Barry Gibb to Tour Starting in February". vintagevinylnews.com. Retrieved 23 September 2012. ↑ "Barry Gibb hits the road with family's next generation – The Australian". Theaustralian.com. Retrieved 27 September 2014. ↑ Brennan, Joseph. "Gibb Songs: 2013". Retrieved 17 April 2013. ↑ "Brothers Gibb News 2013". GSI. Retrieved 29 December 2013. ↑ Watkins, Gwynne (December 22, 2013). "Paul McCartney Makes Merry With Fallon and Timberlake on 'SNL'". Rolling Stone. Retrieved 31 March 2015. ↑ Shannon Carlin. "Watch Barry Gibb Perform with The Roots". News.radio.com. ↑ Late Night with Jimmy Fallon. "Barry Gibb and Jimmy Fallon sings Everly Brothers songs". ↑ CNN.com. "My World News – CNN – Barry Gibb interview". 1 2 Jefferies, Mark (July 11, 2014). "Bee Gees singer Barry Gibb says he wants to die on stage while singing iconic hit Stayin' Alive". Mirror. Retrieved 10 March 2015. ↑ theartofmccartney.com. "BARRY GIBB – The Art of McCartney". Retrieved 22 February 2015. ↑ James, Gary. "Gary James' Interview With T.G. Sheppard". classicbands.com. Retrieved 31 March 2015. ↑ Olivier, Bobby (February 8, 2015). "2015 Grammy Awards: Live updates, winners and notes from music's big night". Retrieved 22 February 2015. ↑ "Bocelli, Estefan, Flo Rida headline Hard Rock Rising Miami Beach". southflorida.com. Retrieved 31 March 2015. ↑ "Miami Beach centennial concert rocks the crowd". Miami Herald. March 26, 2015. Retrieved 31 March 2015. ↑ "Barry Gibb at Hard Rock Global Music Festival, Miami Beach, FL, USA". Setlist.fm. Retrieved 31 March 2015. ↑ "Coldplay close Glastonbury 2016, with help from the Bee Gees". BBC. 28 June 2016. 1 2 "Legendary Singer/Songwriter/Producer Barry Gibb Signs To Columbia Records". Prnewswire.com. Retrieved 2016-10-07. ↑ "Columbia Records Announces Legendary Singer/Songwriter/Producer Barry Gibb To Release First Solo". Prnewswire.com. Retrieved 2016-10-07. ↑ "The Bee Gees". The Telegraph Herald. 22 July 1979. Retrieved 19 January 2013. ↑ "Barry Gibb of the Bee Gees: 'I want to keep the music alive'". The Guardian. 2014-03-13. Retrieved 2016-10-07. ↑ "Gibb buys Johnny Cash's house". USA Today. 5 January 2006. Retrieved 15 April 2007. ↑ "Johnny Cash's Former Home Burns to Ground". Archived from the original on 2 May 2007. Retrieved 10 April 2007. ↑ "The worst part of losing my brothers? We weren't even friends at the end: In a soul-baring confession, Barry Gibb tells of the guilt, remorse and loneliness of being the last of the Bee Gees". Mail Online. Retrieved 27 September 2014. ↑ Davies, Hugh (January 11, 2003). "Bee Gee Maurice critically ill after surgery". The Telegraph. Retrieved 24 February 2015. ↑ "BARRY LEVINE: Mills Brothers one of numerous brother acts to find success in the music business". albanyherald.com. Retrieved 11 March 2015. ↑ "Bee Gee Robin Gibb Dies Of Cancer At 62". npr.org. Retrieved 11 March 2015. ↑ Hall, Mark. (director) In Dreams: The Roy Orbison Story, Nashmount Productions Inc., 1999. ↑ "Frankie Valli – 100 Greatest Singers". Rolling Stone. Retrieved 20 February 2015. ↑ "The Bee Gees' Barry Gibb: "Country Music Always Inspired Us"". Country Weekly. November 4, 2013. Retrieved 31 March 2015. ↑ "Q magazine's 100 Greatest Singers". empireonline.com. Archived from the original on 2 April 2015. Retrieved 10 March 2015. ↑ "The Bee Gees biography". Rock and Roll Hall of Fame and Museum. 1997. Retrieved 25 October 2010. ↑ "John Farnham tops the list of Australia's greatest singers of all time". news.com.au. Retrieved 10 March 2015. ↑ Campbell, Al. "You Don't Have to Say You Love Me/I Don't Know How to Love Her – Jerry Vale". AllMusic. Rovi Corporation. Retrieved 24 February 2015. ↑ "Barry Gibb Chart History". Official Charts Company. Retrieved 22 February 2015. 1 2 3 4 5 6 "Barry Gibb Chart history". Billboard. Retrieved 17 February 2015. 1 2 3 4 "Barbra Streisand & Barry Gibb Top Songs". musicvf.com. Retrieved 10 March 2015. ↑ "The Gibb brothers discography". officialcharts.com. Retrieved 12 March 2015. ↑ "Barry Gibb Songs Discography". Dutch Charts. Archived from the original on 26 April 2015. Retrieved 12 March 2015. 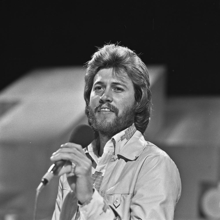 Wikimedia Commons has media related to Barry Gibb.